(16/62) TRENTON – The Department of Environmental Protection has authorized a study in partnership with Montclair State University to determine the distribution and prevalence of clinging jellyfish, a dime-to-quarter sized and invasive jellyfish that packs a powerful sting that has been reported mostly in the Shrewsbury River in recent weeks. The jellyfish, a native to the Pacific Ocean, is very difficult to spot in the water. A sting can produce severe pain and other localized symptoms and, in some cases can result in the need for hospitalization. 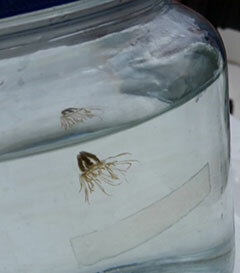 Multiple specimens have been observed and collected in the Shrewsbury River, while a single clinging jellyfish has been confirmed in the Manasquan River. The studies will be conducted in these waterways, as well as northern portions of Barnegat Bay – where the jellyfish has not, as yet, been observed. The DEP has authorized a 30-day study that will involve systematic trawling of the water to collect any jellyfish that may be present, as well deployment of artificial sea grass mats to see if they attract clinging jellyfish, and genetic analysis. The DEP will release its findings to the public after the study is concluded. Depending on the results of the initial study, the DEP will evaluate whether to authorize a second phase of work. The study will be launched within the next week. Beach seines will be used in shallow waters and crews on boats will also be using zooplankton seines in open water in an effort to capture adult jellyfish, known as medusa. Areas of focus for the study will include locations that have submerged vegetation, creek mouths and marinas. Any specimens that are collected will be sent to a laboratory for positive identification. The clinging jellyfish (Gonionemus vertens), is not known to inhabit ocean beaches or other sandy areas, but tends to attach itself to submerged aquatic vegetation and algae in back bays and rivers, areas not heavily used for swimming. DEP encourages the public to exercise common sense and caution in areas where the jellyfish have been discovered for recreation. Anyone wading through these areas, especially near aquatic vegetation should take precautions, such as wearing waders to protect themselves. A hot compress can then be applied to alleviate pain.